I’ve always been a really awkward person. When faced with a situation where I have to interact with strangers (or “awkwaintences” – acquaintances I don’t know well enough to not be awkward around), I think I come off as either the extremely overenthusiastic creep or the opposite painfully disinterested person who couldn’t give. There are always tourists in town, and in my own little awkward mind, I always want to greet and welcome them. But it never usually translates well when I’m red, sweaty and gasping for air. When I try for a simple smile (surely a winning manoeuvre that could not end in disaster), I get a really odd blank stare in return. I must really look like I’m doing nothing more than scrunching my face up in pain. 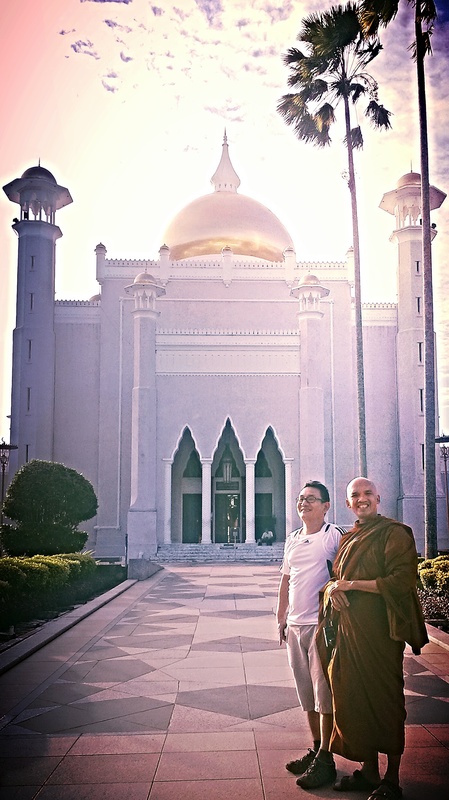 Anyway, yesterday must’ve been a good day because I helped a happy monk, accompanied by his equally merry friend, take some photos at the Sultan Omar Ali Saifuddien mosque in town. Must’ve been a hilarious sight to see. They look like happy fellows. I’m sure you were of great help.